When we pulled up at the hotel we were all impressed as it looks amazing from the outside, exactly like the photos online. My children were so excited when the transfer bus pulled up and could not wait to get inside the hotel. As the hotel looks so unusual they do have security on the door and a sign saying guests only, to stop people not staying at the hotel from getting in which we really liked. Entering the hotel the reception area is decorated like a cave and has a model of the hotel in which is amazing. We were greeted at reception by Mo, the customer service rep who is really lovely and friendly and a credit to the hotel. We were quickly checked in, after filling in a few forms and paying the Balearic Tax (Only the adults), fitted with our all-inclusive wristbands (bright pink) and shown to our room. We had paid an extra £120 at the time of booking to book a ground floor terrace room with Jet2, and we were so glad we did as we loved the room. We were in room 53 which is behind the tower in the pool and near the children's paddling pool. 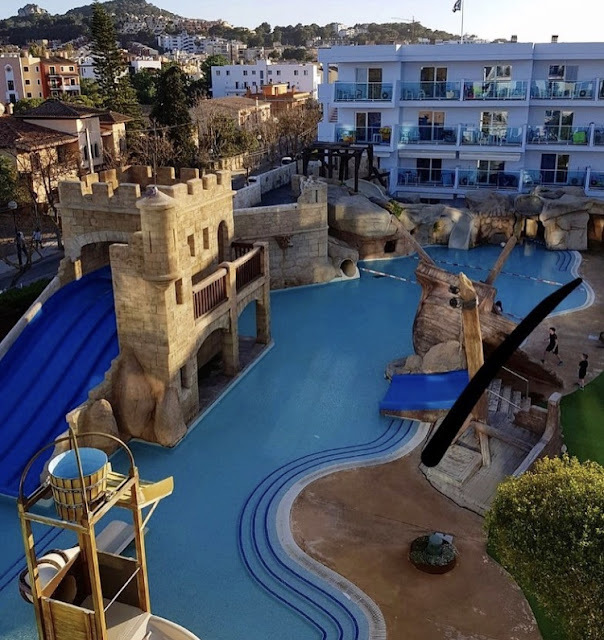 All the rooms in the hotel face the pool, the hotel is in a horseshoe shape and it was much smaller than I expected but ideal when holidaying with young children. The rooms are all one bedroomed apartment, my father in law was on the third floor and his room was the same as our room, they have a bedroom at the back, bathroom in the middle and then a lounge/kitchen area at the front which leads out onto the balcony or terrace depending on what kind of room you are staying in. The apartment was decorated white and had wooden flooring throughout, it was perfectly fine size wise for the five of us and was spotlessly clean and the maids came in daily to clean the rooms. The bedroom had a huge king sized bed in, it could easily fit the five of us and was very comfy. There was lots of wardrobe space, a dressing table, luggage rack and bedside tables and a safe in the room. 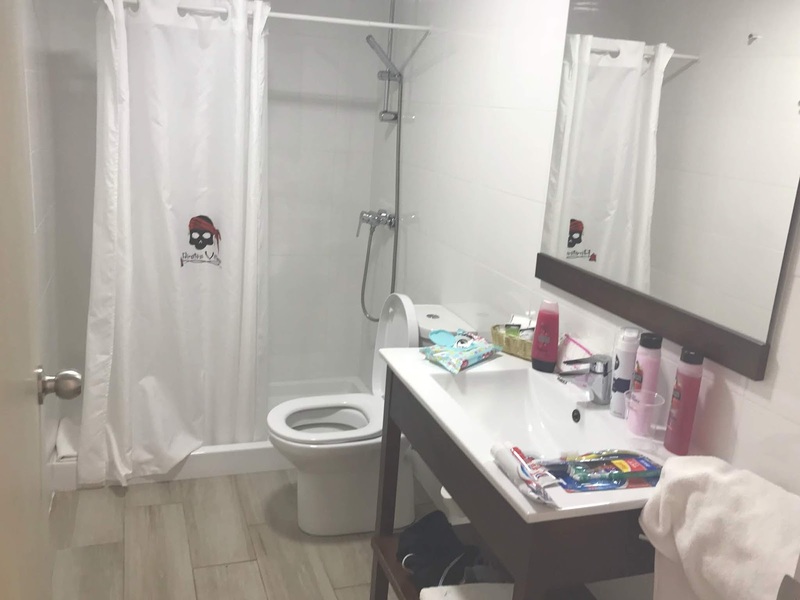 The bathroom was small and basic but very clean and perfectly fine for a week's holiday, it had a shower, toilet and sink unit in as well as a wall-mounted hairdryer and plenty of towels. The lounge/ kitchen area had a small kitchen area with a sink, hob, microwave and fridge in as well as cooking utensils etc. As we were all inclusive we didn't use any of these or look at them so I can't comment on them. There was also a dining table with four chairs and a sofa bed. As we had three children there was also an extra camp bed in the room for my son, the girls slept on the sofa bed which you could turn into a large king-sized bed or use as two singles which my girls did. During the day we had to put the sofa beds away as when they were out there was no room. The apartment had patio doors on which lead onto the terrace which had a table and two chairs and two sun loungers on. I was a bit worried my son would wander out the patio doors when we weren't looking but the handle was high up and there was no way a young child would manage to open them. The terrace was fenced in with a gate leading out to the pool area and was astroturfed which is perfect for young children. We loved having the terrace as we did not have to reserve sunbeds around the pool and it was so handy for the children going in the pool as the pool was about ten foot away from our room. I would highly recommend pre-booking a terrace room if you can get one when visiting with young children. 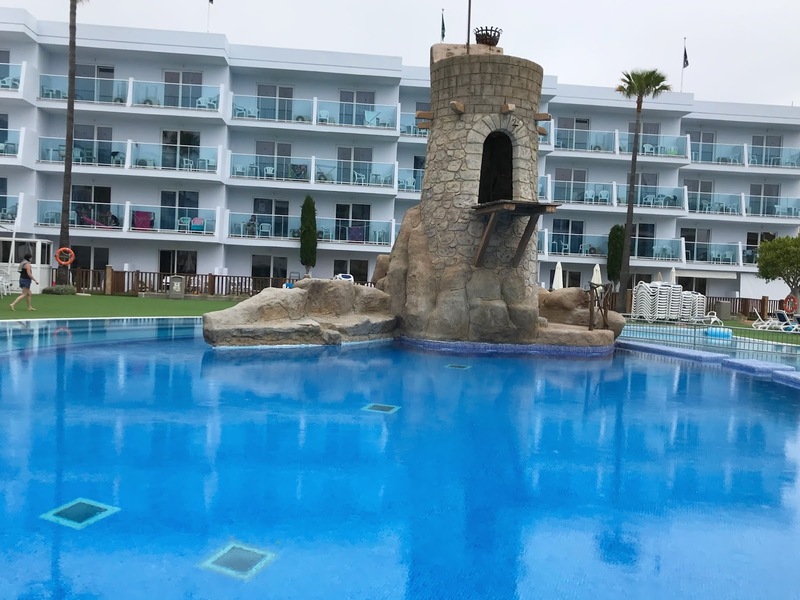 The pools at Pirates Village are one of the main draws to the hotel, all around the pool area is fitted with astroturf making it much safer for children than slippy tiles you often find around hotel pools. There was plenty of sunbeds around the pool area but these get chained up overnight and are unchained once the pool opens at 10am. There is a main pool which is broken into sections of varying depth and has the big tower in the middle that is used for pirate shows during the week, the deep part of the pool is very deep but the shallower bits around the edges are fine for children. There are also two small paddling pools attached to the main pool and my little girl spent most of her time in these playing with other children. There is also a splash pool which has slides in and is fairly shallow, my young children could stand up in this pool. It has a small children slide with a water bucket, a small blue children's slide, a bigger blue side that four people can go down at once, a slide in a tunnel and a twisty slide. 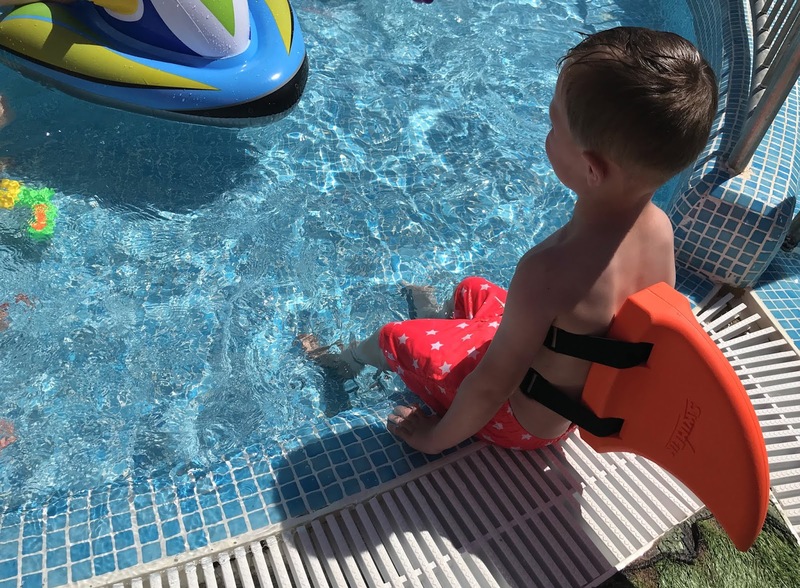 My teen and 4-year-old son loved the slides and they would spend hours going on them or floating around on inflatables. Obviously, you need to supervise your own children around the pools but there was always two lifeguards on duty around the pool area too which was reassuring. Children are encouraged to have fun in the pools at Pirates Village, so inflatables and water guns are allowed and you probably will get squirted off children, especially when the pirates have water fights in the pool with the children. My children and partner really loved the pool scene here, although it was far too cold for me to spend much time in. The entertainment team at the hotel are amazing, every single review you read about Pirates Village on Tripadvisor etc comments on how amazing they are. My 4-year-old son took a huge liking to Alex and he was lovely with all the children and so entertaining to watch during the shows. During the day there will be different entertainment available such as basketball, shooting, darts etc all of the daytime entertainment is showing on a screen in reception. My fifteen-year-old daughter also took part in Mermaid lessons one day in the pool, she was given a mermaid tail and showing how to swim with it on. I think it cost about ten euro and looked like good fun, Sophia my five years old really wanted to take part too but you have to be able to swim unaided to take part. On an evening there is a mini disco which started around 8pm, this is outdoors on the pirate stage and there was plenty of seating. A few nights when it was cooler they put the roof on the outdoor area and bring out heaters so it was never cold despite visiting early in the season. Each night it is a different show, again this is advertised in the reception area. 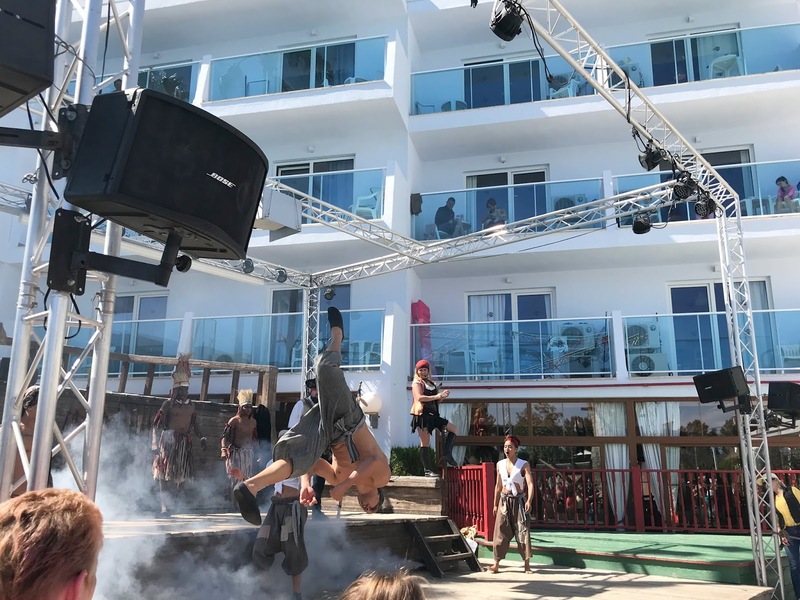 When we visited there was three evening pirate shows, a parrot show, and a Peter Pan show as well as the Sunday afternoon pirate attack around the pool which is not to be missed. On a Wednesday the entertainment team have a day off so there was no entertainment, we went to play mini golf this night. 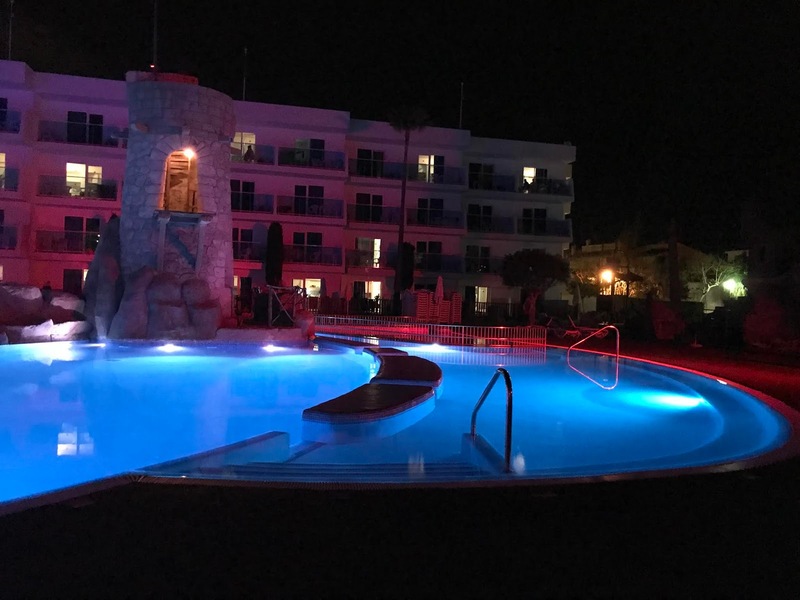 Most nights my children wanted to go to bed around 9pm after the mini disco ended so we would put them to bed and then we would sit on the terrace with a drink watching the show as we had a great view from our room. 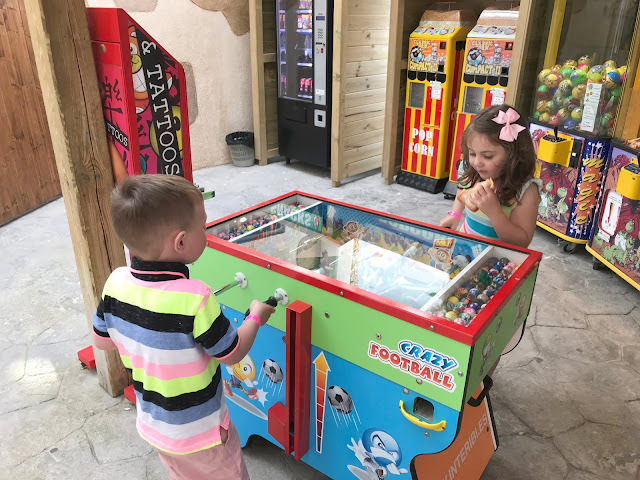 I am not normally a fan of kids clubs and I was adamant that there was no way I would send my children, especially as they were just 3 and 4 when we visited. However, after seeing how safe it was I did let them go a few times. The kids club was really secure, it was in a locked room and you had to sign your children in and out, if they wanted to leave then they would ring your mobile or call for you over the tannoy system. The staff all spoke perfect English (some of them were actually English) and were lovely with the children. There was a room with games and computers in and a secure outdoor area with trampolines and bouncy castles. Sophia went and had her makeup done, they went to watch a film one afternoon, they went pizza making and bowling, they only visited for an hour a day but they really liked it. 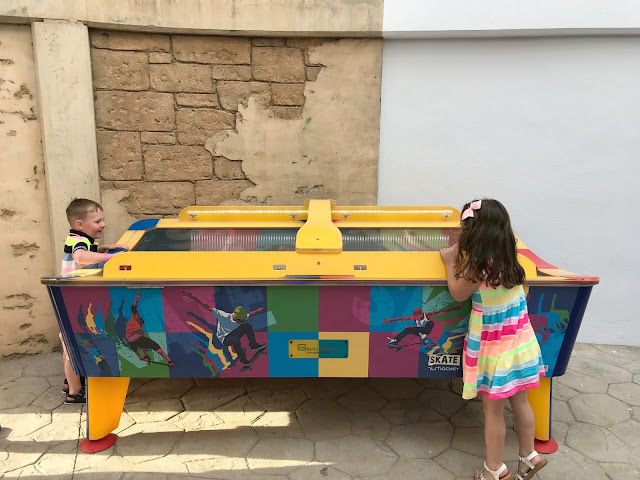 The kids club is for children aged 3 to 12 and was free, you just turned up on the day and sign your child in leaving your room and phone number. As I mentioned the hotel is quite small, it has four floors and is in a horseshoe shape around the pool area. It is really secure with only one entrance and one exit and was really easy to find your way around. Outdoors there is the pools and stage, there is a bar and restaurant area and the reception. Near reception there was a little children's bathroom with small toilets and urinals, my three-year-old loved these. They also had baby baths and changing areas which is nice as the bedrooms only have showers in. 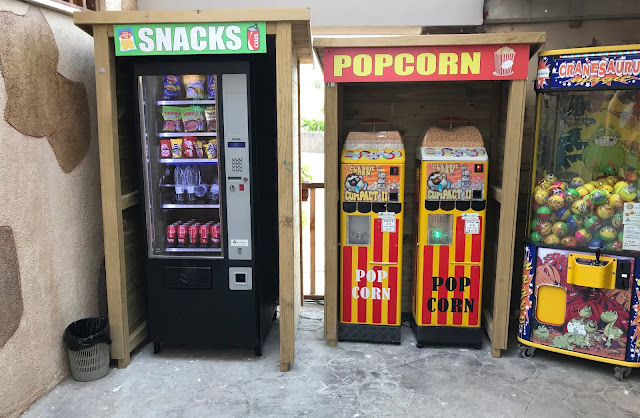 There was also a small amusement area near the toilet block, just off reception which had air hockey tables, a few grab a prize machine (we ended up bringing 7 teds from it home with us), popcorn and vending machines. Plus a small sports area where they played the daytime games. There was laundry facilities but we didn't use these and you could also borrow irons and things at the reception. 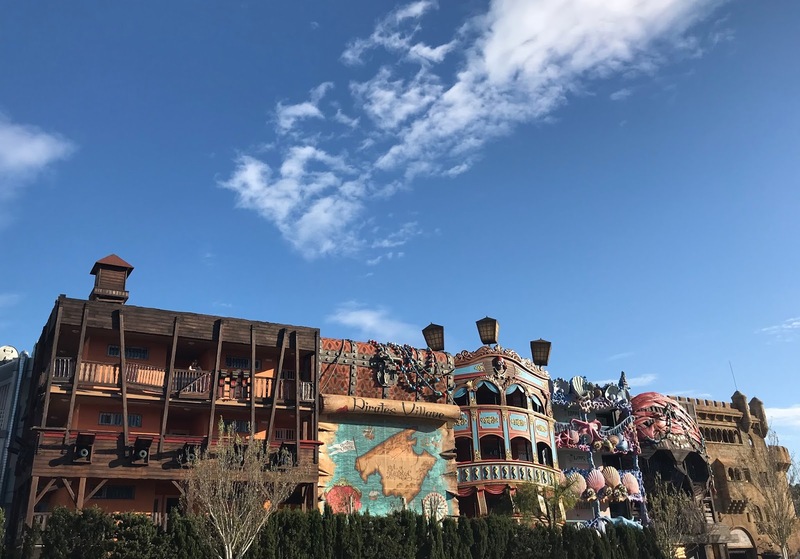 I have already written a blog post about the all-inclusive food at Pirates Village which you can read here. Breakfast, lunch and evening meals are all buffet style in the main restaurant area and there was plenty of choice and a child buffet with plain dishes like pasta, pizza, nuggets etc. All inclusive guests can also order from the snack bar between 10am-6pm which serves hot dogs, burgers and toasties plus extra meals you can purchase. There is a self-serve bar with hot drinks, water, slush, soft drinks and alcoholic drinks available. 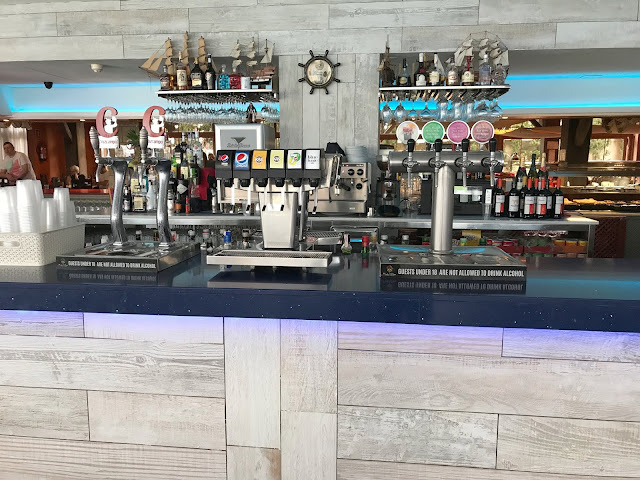 If you are self-catering you can pay to buy drinks from the bar and snack bar or you can upgrade to all inclusive once at the hotel. They also have branded drinks, snacks and ice lollies you can buy from the bar whatever board option you are on. 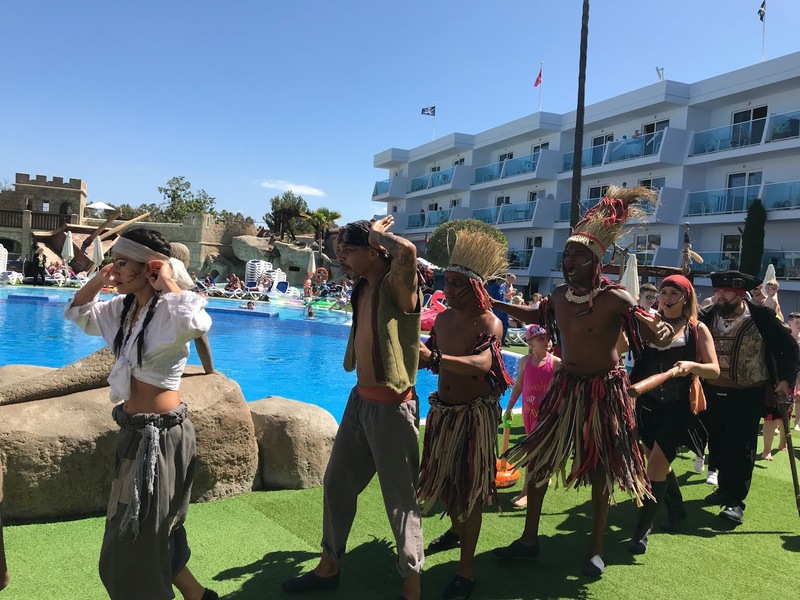 We loved the location of Pirates Village, Santa Ponsa is not too far from Palma Airport so is a relatively short transfer time. 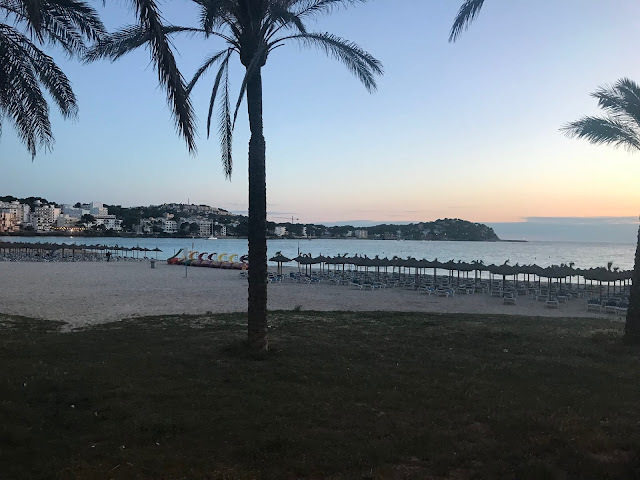 Santa Ponsa is a bay and there is a quiet side and more lively side, Pirates Village is on the quiet side. It was a five-minute walk to the beach, which is lovely with golden sand and warm shallow water to paddle in. There is lots of shops and restaurants close by and a large supermarket just a few minutes walk from the hotel and a Chinese supermarket opposite which was great for buying inexpensive inflatables, water guns etc. 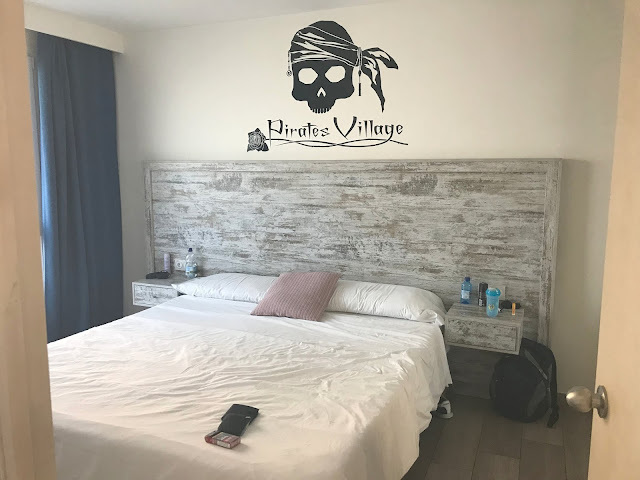 Pirates Village is also just a few minutes walk from the bus station, meaning you can easily get the bus into the capital Palma. We didn't really have any trips out though as the children just wanted to be in the pool or at the beach all of the time. 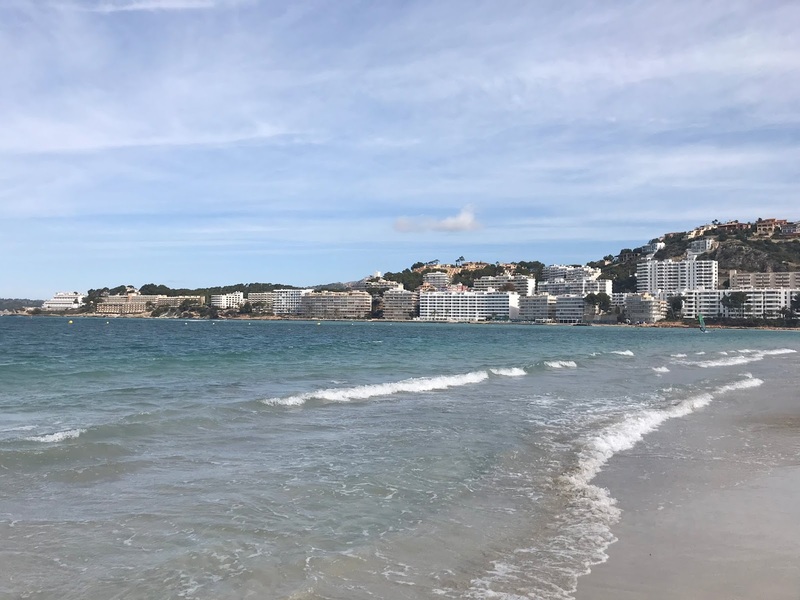 We did explore Santa Ponsa most days and visited lots of shops and had a few meals out. We felt really safe wandering around with the children during the day. 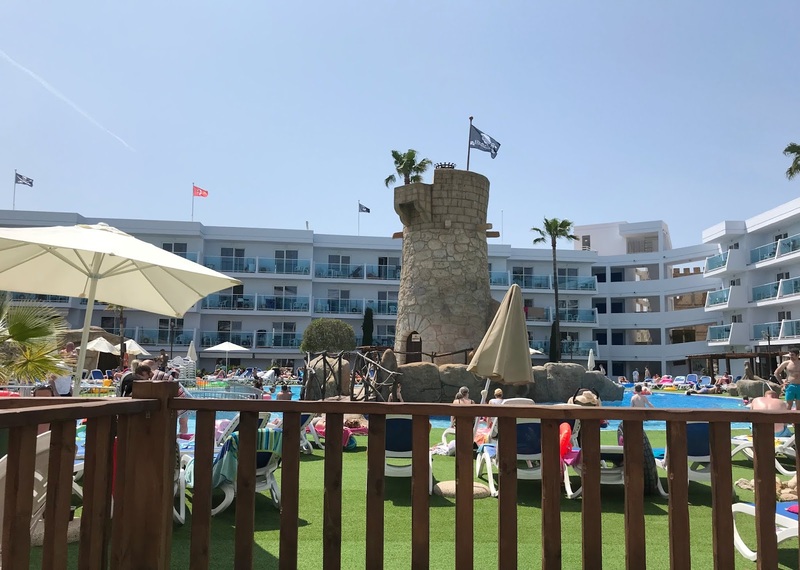 We all had a really lovely week staying at Pirates Village in Santa Ponsa, we have been home four months now and my little boy still talks about it and asks to go back every single day. 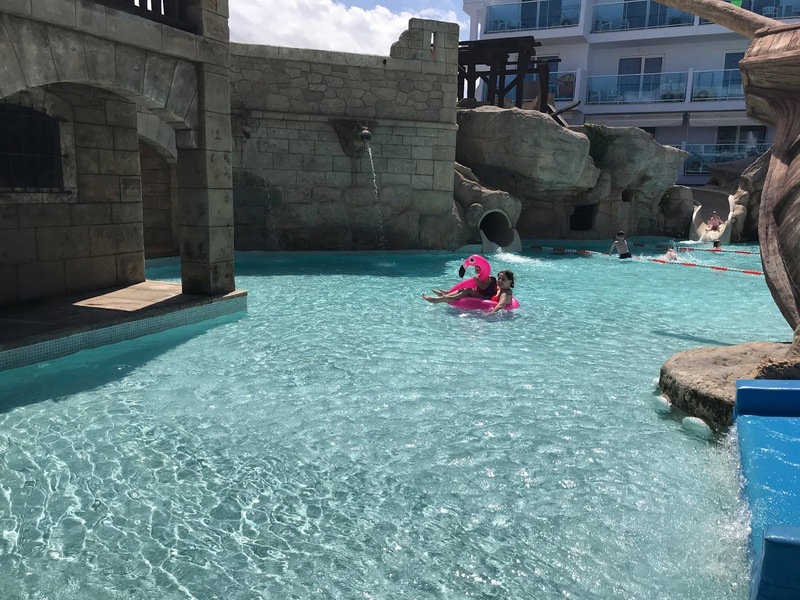 The hotel is perfect for young children and is so child-friendly, it looks amazing, is spotlessly clean with cleaners going around cleaning non-stop, the staff were all lovely and so helpful, the entertainment staff were brilliant and the pools were lots of fun. I was a bit worried that things would be a bit full-on and I would be made to participate in activities (I am not a fan) but that was not the case at all. The entertainment staff only interacted with people who wanted to join in (mostly the kids and dads) and left everyone else alone to relax in peace. 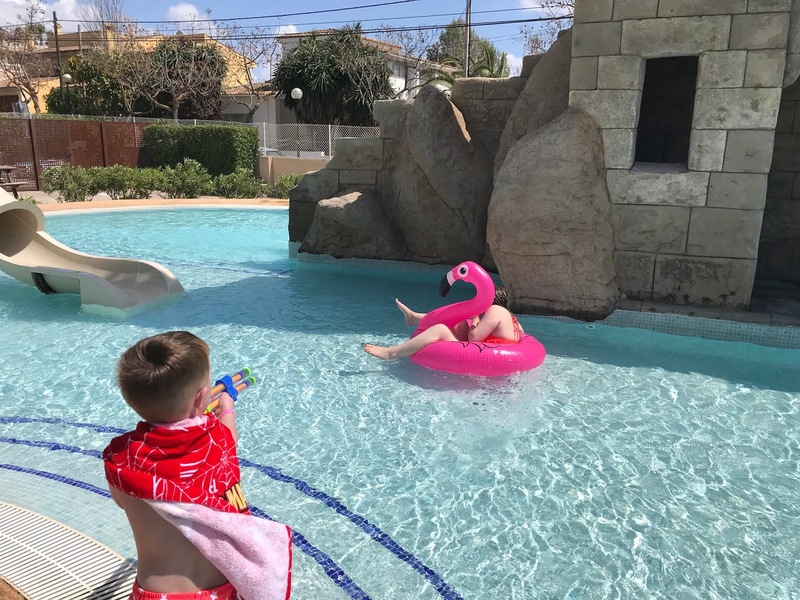 Apart from Sunday pirate attack day you can sunbathe around the pool and read a book in peace, well as much peace as you can when holidaying with children. 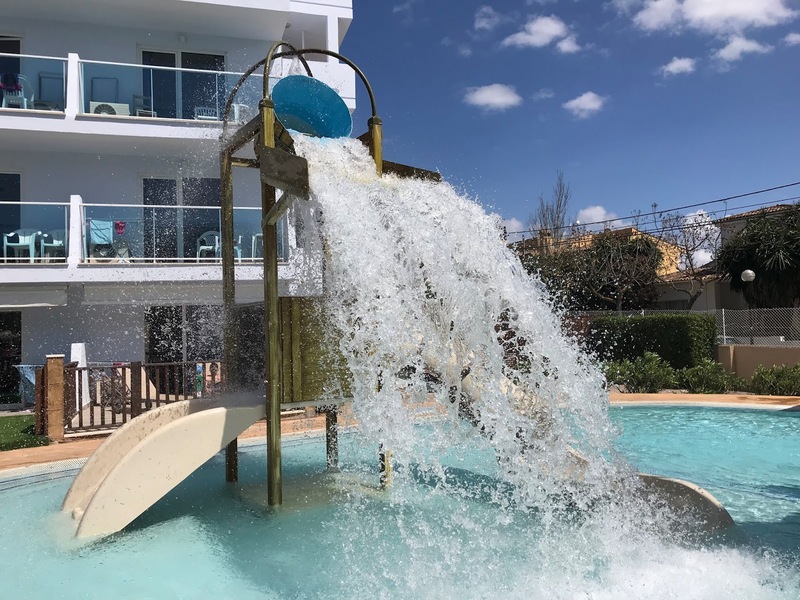 The hotel is only 3* so it is not going to be luxury but it was a lot better than we thought it would be and it was perfect for a family week holiday with young children. 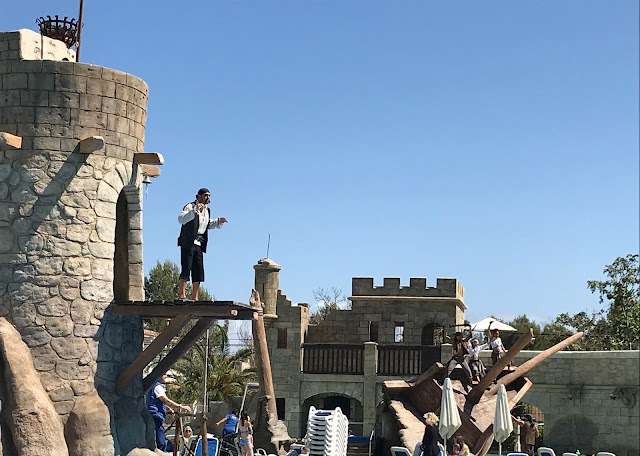 The only things we could fault were that the nighttime entertainment was near the deep end of the pool so I was on edge the whole time in case my children fell in, however, Pirates Village has since put a fence around the pool on an evening. The only other thing that would have been nice was for a do not disturb signs, as a few times the maids came in when we were trying to get the children to have afternoon naps. But they are just small niggles and there was generally nothing else we could fault. 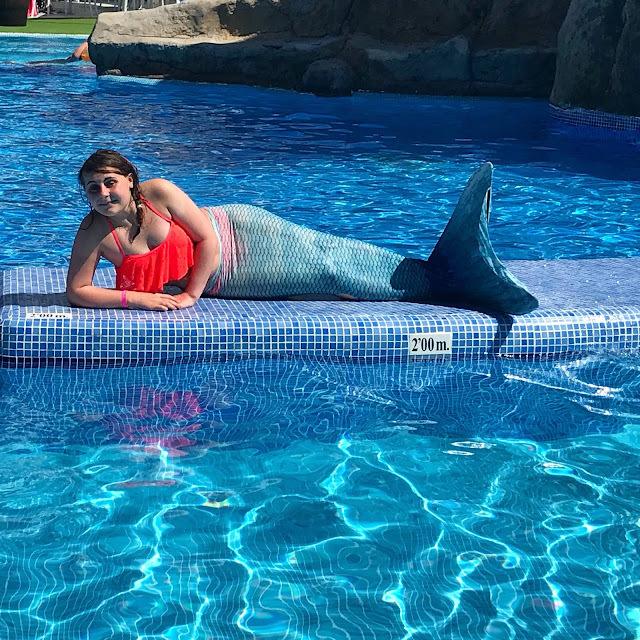 The hotel is full of families and it is ideal for children under ten, however, my fifteen year old also really enjoyed herself and has asked to return. 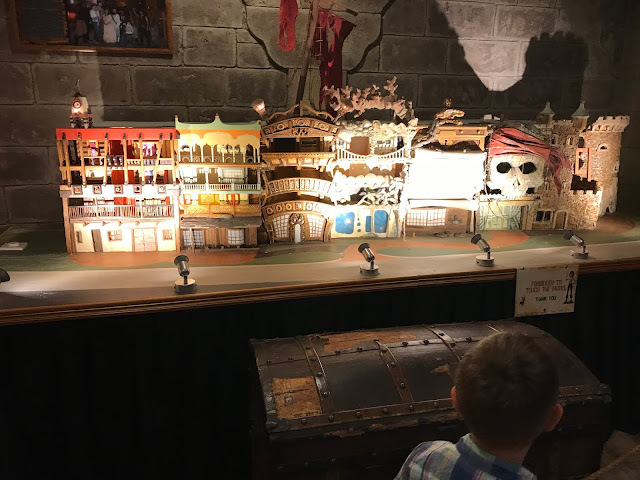 If we weren't getting married next year then I think we would have already booked up to return to Pirates Village as my children really did enjoy themselves so much staying here and we made lots of family memories to treasure. We paid for this holiday ourself and were not asked to write this review, I just thought people might find it useful. 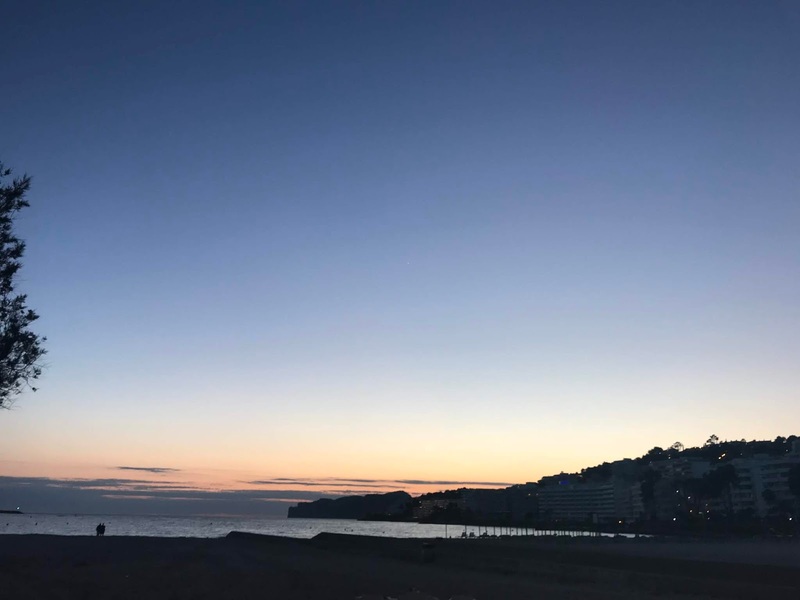 Fab review - we can't wait to stay. 5 more sleeps! We have just booked our 3rd visit for July 2019. We can't wait. My 2 children absolutely love the place and as a single parent I feel completely safe and comfortable in this hotel. A definite 10/10 from us. Sounds brilliant!! Perfect break for the whole family. We are looking at options for next summer now! This is a lovely hotel. I love the bedroom. We are not normally people for package holidays but this looks fab! That's a brilliant review of what sounds like a very family-friendly resort. Nice to hear they've made improvements with the fence around the pool for the evening entertainment. I visited Santa Ponsa on my first ever holiday abroad over 20 years ago. I wonder has it changed much. This is such a lovely place to visit especially with the kids and of course if you're a kid at heart. That looks really great. I just read Sam's post.. you must be who recommended it to her? It's good to have personal recommendations - if I could ever talk my husband into it the kids & I would love it here! The big pool is now screened off at might from around 5:30pm to 10:00am ( when I was there in July) and there are 3-4 life guards. 2 at big pool. 1 at top of tunnel slides and 1 at top of wavy slide.